sportsmatrix » Who Is The Foulest Of Them All? 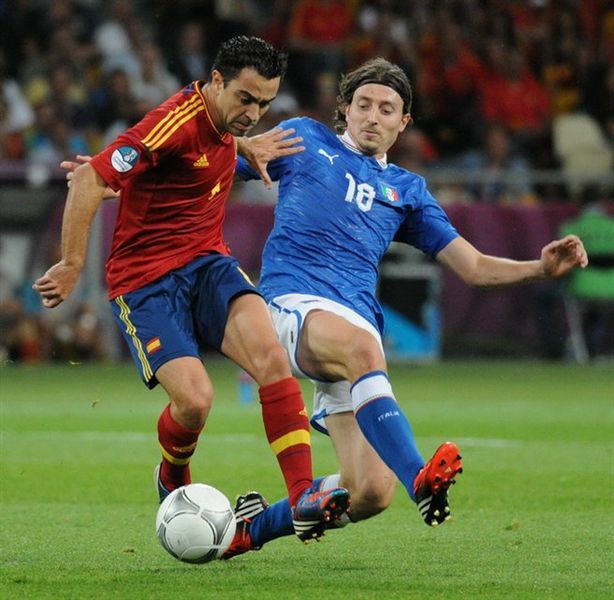 As the clubs in Italy get ready for another round of games in Serie A, we decided to go off the beaten path and look at something completely different – fouls. It may be frowned upon and against the rules but fouls are very much a part of the game. 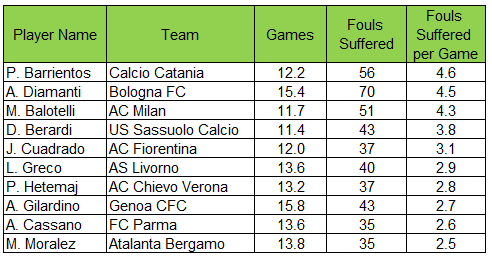 Using our extensive stats, we decided to see which players and teams commit the highest number of fouls per game and, in turn, which players and teams suffer the most fouls too. 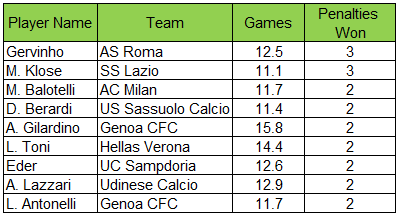 When undertaking this analysis, we decided to limit our search to players who had played a minimum of 10 games in Serie A this season. To start off with, let us look at which players commit the most number of fouls per game. Now it is important to keep in mind that just because a player commits a high number of fouls, does not necessarily mean that his fouls are a liability to the team. 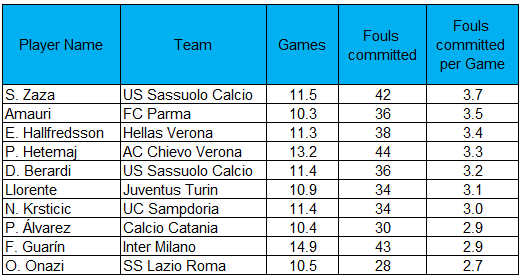 In the table below we can see that Simone Zaza of Sassuoloa has committed the highest number of fouls per game but only 2% of those fouls actually ended up in a dangerous situation – in this search a dangerous situation is one where the opposition, as a result of the foul, has a real chance of getting a shot on goal or scoring a goal itself. As stated, it is not the foul or even the nature of the foul that is more detrimental but rather whether or not those fouls lead to the opposition finding itself in a dangerous situation. In this category we can see that Giuseppe Vives of Torino is main culprit when it comes to giving fouls that lead to a dangerous situation. A name to look out for is number 3 on the list is Chievo’s midfielder Perparim Hetemaj. His Chievo take on Juventus tomorrow night and with them comes Carlos Tevez who we will see features highly on the list of players that are fouled so this could be an interesting match up! 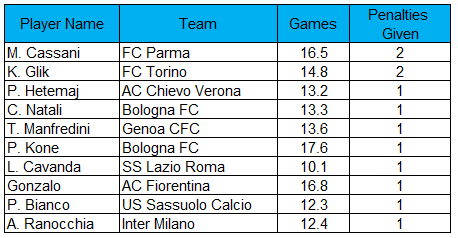 In terms of penalties conceded, we can see that both Mattia Cassani of Parma and Kamil Glik of Torino are the top of the table. So that covers our look on the players that commit the fouls but what about the players that are fouled? In the table below, we can see who the most fouled players are and it is no surprise to see Mario Balotelli featuring high up the list. As with the above, it is not just about being fouled but what happened as a result of the foul. 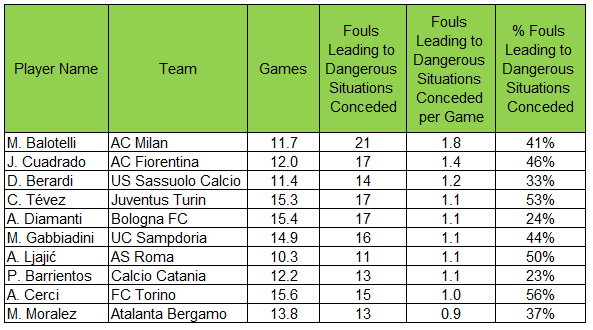 When it comes to fouls that lead to a dangerous situation, Balotelli shoots up to the top of the table with 1.8 of the fouls that he suffers per game leading to Milan being in a dangerous situation. As mentioned before, Carlos Tevez’s Juventus are taking on Chievo and with 1.1 of the fouls that the Argentine suffers leading to Juventus being in a dangerous situation, this could be tricky for Hetemaj and his teammates. Chievo’s fans may be hoping that the injury that Hetemaj suffered against Lazio will keep him out of this game! As for the players who win the teams penalties, we saw that the top players are Gervinho of Roma and Klose of Lazio. It is interesting to note that Gervinho’s former team, Arsenal, have only won 3 penalties all season whereas he has won the same number on his own.